Principia students usually take it in stride when there’s a four-legged visitor in the classroom, since policy allows teachers to bring well-mannered pets to school. So it was unusual when a recent visit by two black Labradors created such a buzz in Kathy Bailey’s third-grade classroom. The reason soon became clear. These were not just your everyday teachers’ pets (pardon the pun) but genuine canine VIPs from Support Dogs, a St. Louis-based nonprofit that identifies, trains, and places service dogs around the country to assist individuals with special needs. 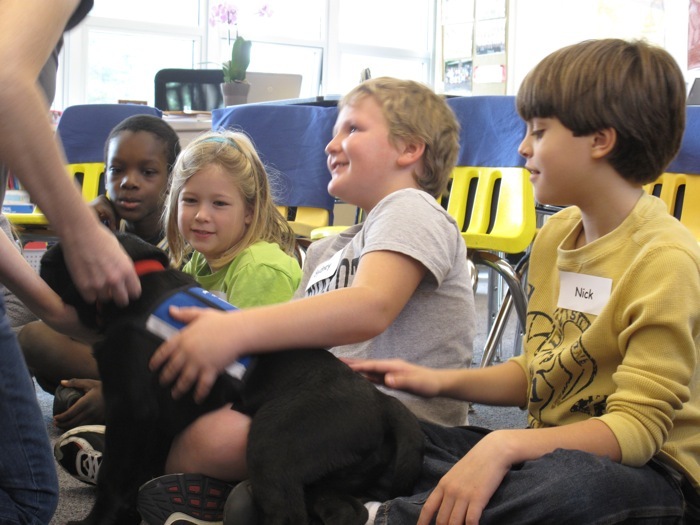 As part of the School-wide integration of community service into the curriculum, the third-grade students and their teachers are continuing an association formed last year to give of their time and talents in creative ways to help Support Dogs further its mission. And in the process of this experiential learning, the students are absorbing interesting new information and developing important skills. The visiting dogs’ two handlers (one of whom was Principia mom Amy Woolston) explained and demonstrated the patience, skill, and teachability of the support dogs—Obi, a mature and experienced black Labrador, and an eight-week-old puppy, Boggs. Obi and his handler showed how support dogs can find and retrieve dropped or distant items for their owners (for example, a misplaced set of keys or a ringing cellphone); remove items of clothing (such as socks or jackets); carry bags; and pick up items from counters. Immediately after the demonstration, the third graders helped fill several kongs (hollow, rubber chew toys) with peanut butter, to be frozen and used as bedtime treats for dogs-in-training. In coming weeks, the students will create posters and artwork for Support Dogs’ open house event (the work by last year’s students was a great hit among visitors). They will also prepare doggie treat bags, research “green” cleaning materials that can be used in kennels, and write letters to pet supply stores requesting donations of dog biscuits. The children were all amazed to see how a tiny, playful puppy such as Boggs could eventually—with love, patience, and firmness—be transformed into an attentive, tireless, and loving helper like Obi. And they all had plenty of questions. The good news for this young man is that Boggs will continue to visit third grade in coming months. Since the puppy will live and be trained in a women’s prison (an avenue by which Support Dogs provides skills and companionship to those incarcerated), he will also need to work on socialization, meeting new people, and greeting appropriately—and visits with affectionate third graders provide the perfect opportunity for him to do so! A different group of students will work with Boggs on each visit, while the rest of the students undertake various chores for Support Dogs.